Derek Cleave is a partner in Christian Ministries, Gods Word for today's World - an international organisation dedicated to preaching the gospel and teaching the church. 1st Peter was written by the Apostle Peter to encourage believers for whom the storm clouds of persecution were gathering, just because they were Christians. To encourage them he first reminds them that suffering is temporary, and that faithful living in times of suffering will produce eternal benefits. He develops this theme to show that such a lifestyle, lived out in difficult and dangerous circumstances, is an effective witness to unbelievers, and will result in church growth - the very opposite effect intended by those who persecuted them. 1 Peter : Focus on the Bible by Derek Cleave was published by Christian Focus Publications in March 1999 and is our 24646th best seller. 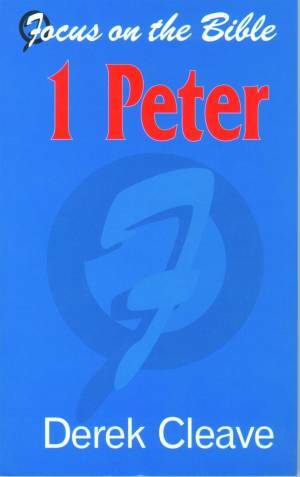 The ISBN for 1 Peter : Focus on the Bible is 9781857923377. Be the first to review 1 Peter : Focus on the Bible! Got a question? No problem! Just click here to ask us about 1 Peter : Focus on the Bible.